Chestnut mousse, or mousse aux marrons in French, is to die for. In France, I would rarely make it as it is easier to buy the Marronsuis Nestle brand. It's as good as the homemade version. Unfortunately, it is not available in California. I found that my local store carries French chestnut puree, so I bought some and came home and made the delicious goodness right away. In a mixing bowl, whisk the mascarpone cheese to soften the product. Add the chestnut puree, vanilla and brandy extracts. Set aside. 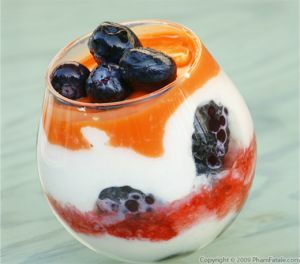 In a mini bowl, dissolve the agar in 2 tablespoons of heavy cream. Set aside. Beat the egg yolks with the sugar in a small stainless steel mixing bowl until all the sugar is dissolved. Place the vanilla chips in small stainless steel bowl. Prepare a double boiler: Fill a saucepan with water, make sure the water barely covers the height of the stainless steel mixing bowl. I always like to add a little kitchen towel at the bottom of the saucepan. The saucepan won't jiggle and there won't be any splatter of water in your mixture. Bring the water to a boil then lower the heat to a gentle simmer. Place the stainless steel bowl in the saucepan and gently melt the vanilla chips at a low temperature. Add the egg yolk mixture and start whisking the egg mixture vigurously for about 3-5 minutes using an handheld mixer. Add the agar cream mixture and stir constantly. Remove from the heat. Add the egg mixture to the chestnut mascarpone cheese. Clean your handheld mixer in hot soapy water. In a stainless steel mixing bowl, place the egg whites. Add salt. Beat the egg whites for about 2 minutes to a medium speed. Increase to the maximum speed and keep beating for another 2-3 minutes until the whites are stiff. Do not overbeat or the texture will become grainy. 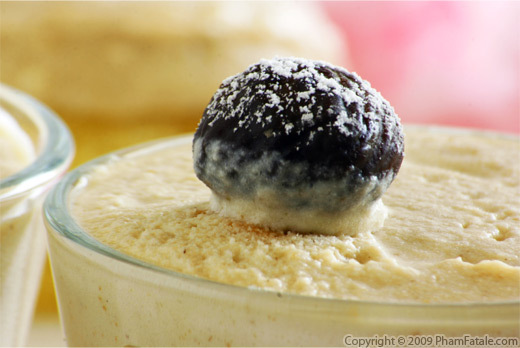 Pour 1/3 of the egg white mixture into the mascarpone egg mixture then gently stir everything to soften the batter. Pour the rest of the egg whites and using a wodern spoon, gently fold the egg whites into the mascarpone mixture to get an airy batter. Clean your handheld mixer one more time in hot soapy water. Just make sure your handheld beater is clean prior to whipping the cream for an optimum result. The whipping cream should be whipped cold. Whisk the remainining heavy cream until soft peaks. Using a silicone spatula, gently fold the whipped cream into the mascarpone egg mixture to get an airy batter. Plastic-wrap the container and place in the refrigerator at least 2 hours or overnight. 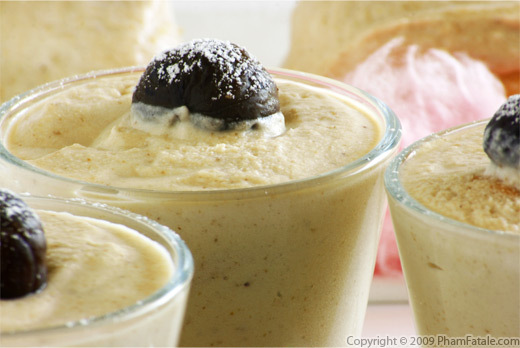 Garnish each mousse with a marron glacé. Here's the version topped with a marron glacé. The pink in the back is cotton candy. Yum! 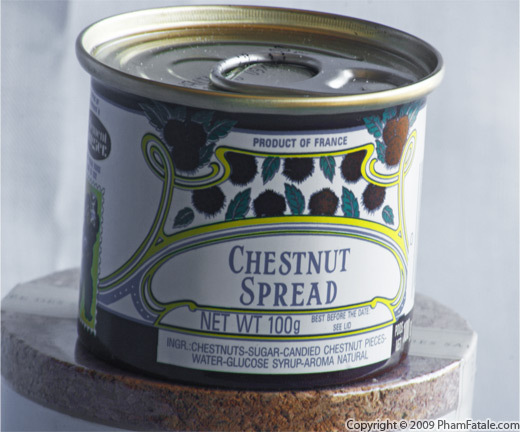 My local market carries chestnut purée but you can also find it online. I prefer Guittard vanilla chips but if you can't find any, you can substitute with white chocolate chips. 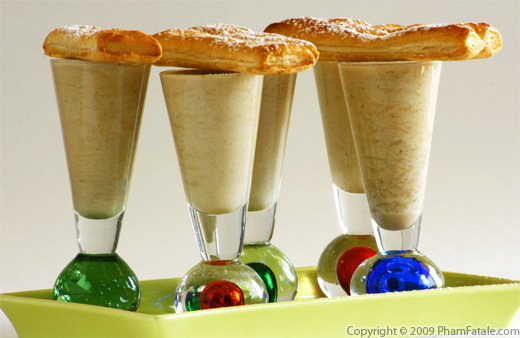 This recipe yields 6 glasses or 12 chestnut torte (chestnut mousse topped sablé cookies). 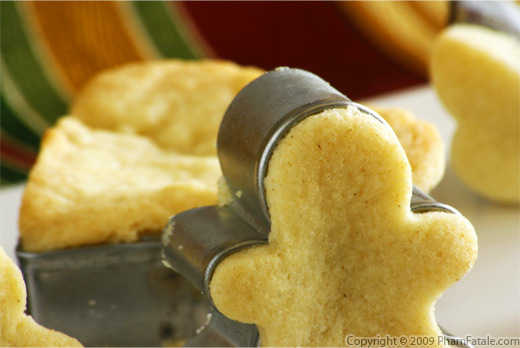 Bake each sable cookies in a 2.5-inch diameter and 1.5-inch high circle cutter (do not butter the circle cutters). Let the sable cookie cool down completely in the circle cutter. Then pipe the chestnut mousse onto the sable cookies to the top of the circle cutter. Plastic-wrap the circle cutters and place in the refrigerator at least 2 hours or overnight. Before serving, gently unmold the sable using a hairdryer (on low) or very carefully with a pairing knife. The combination of the two texture is divine! The use of agar is optional. I used it so that the mousse would hold together when it's spread onto the sablé cookies. Agar agar powder is a good gelatin substitute for vegans and vegetarians. It is derived from seawood and is cooked the same way you would use gelatin powder. It is widely used in Asia. I used it for my Vietnamese jello cake. Marrons glacés are a French specialty and very popular during Christmas season. They are glazed candied chestnuts. 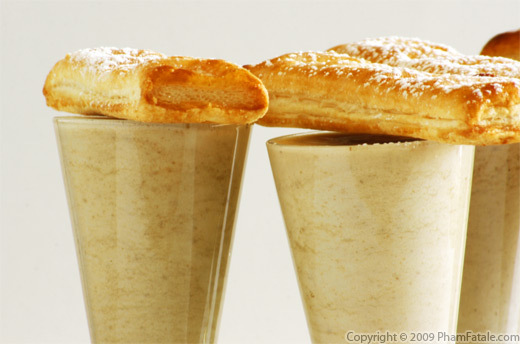 I piped the chestnut mousse into shot glasses and topped them with Italian ladyfingers. Published By: Jacqueline Pham on April 10, 2009. Grace: The flesh of a chestnut is sweet, nutty and starchy. I remember getting roasted chestnuts during the holidays in the street of Paris. There would be street vendors along the "grand magasins" (Huge Famous Department Stores. It's worth a try. These are just gorgeous. Love how you piped them into the shot glasses...wow! Hey, it looks so gooooodddd!!! :X I love ur recipes so much. :) i don't want to add eggs into the dessert as well. This is a random question but do you remember where you got your shot glasses? I've been looking for round bottomed shot glasses just like those.